California is a very diverse land filled with all types of people from all corners of the world. With such diverse backgrounds come people with various interests and experiences. One thing that California does to reflect some of these groups is allow drivers to have personalized license plates reflecting their particular personalities and backgrounds. These can range from Special Interest plates, like the upcoming Snoopy plates, all the way to Special Recognition plates, such as Medal of Honor recipient plates. With so many different types of personalized plates, it can be hard to keep track of which are offered and how to attain them. We’ll go over a few here, and explain how best to go about ordering a personalized plate that meets your own unique personality! Special Interest Plates are available for autos, commercial vehicles, trailers, and motorcycles. Each plate differs in appearance, usually reflecting the specific interest with some sort of unique design or detail. Most of these plates are available for purchase for any driver (check specific requirements before purchasing). The fees used when purchasing Special Interest Plates usually go toward supporting that interest. For example, purchasing the Coastal Commission plate, known as the Whale Tail plate, will send fees to the California Coastal Commission and will help protect and restore California’s coast and ocean. Special Interests Plates can range from Pet Lovers to Firefighters to Memorial plates that help fund anti-terrorism in California. Check out the full list of authorized California Special Interest License Plates to see if one strikes your own interest. For the most part, there are no special privileges for having a Special Interest License Plate other than being able to show off your unique interest to others and support a cause of your choosing. Check the full list for more details specific to the plate of your interest. Special License Plates are, for the most part, more selective than Special Interest License Plates. These plates usually require some sort of documentation or requirement to be met before these plates are made available for purchase. For example, the Disabled Person license plate falls under this category, and a driver cannot purchase this type of license unless the driver is disabled as defined in VC §295.5. These Special License Plates differ greatly, ranging from Press Photographer plates to plates for a Horseless Carriage. Check the list of Special License Plates to see if you meet the requirements for any of these plates. There are various benefits for having a Special License Plate on your vehicle depending on the type of plate you have. For instance, the Disabled Person/Veteran License Plates allow drivers to park alongside blue and green curbs and in parking spaces with the International Symbol of Access (wheelchair symbol). Also, with Disabled Plates or placards, drivers are allowed to park at metered parking spaces at no charge. Some Special License Plates reduce or remove some operation fees, such as the California Exemption Plates. Be sure to check the full list for more details regarding your specific type of plate. Special Recognition License Plates can be issued to drivers who have met certain requirements usually related to military service or achievement. Certain documents are required to prove eligibility for such plates, and depending on the specific type of plate there may be some fees attached. Special Recognition License Plates are a great way to distinguish yourself and show pride in your service, position, or achievement. Some examples of Special Recognition License Plates are the Congressional Medal of Honor plate and the Purple Heart plate. Not all Special Recognition License Plates are related to military achievement; there are plates for Pearl Harbor Survivors and Gold Star Family plates for family members who lost a family member in the line of duty. The main benefit of having a Special Recognition License Plate is to show honor and pride for your military accomplishment or the sacrifice a loved one made. Check the full list to see if you qualify for any of these plates. Check out the lists of personalized plates and read up on the specific requirements and fees of the plate you are interested in. Once you’ve gathered the proper documents and fees, you can order your personalized plates online at www.dmv.ca.gov or you can mail the Special Interest License Plate Application and appropriate fee to the address located at the bottom of the form. Personalized license plates will usually be ready for pickup at the DMV within 8-12 weeks after being ordered. You will be notified by mail when they are ready for pickup. Check out this link for more general information and FAQ regarding personalized license plates in California. 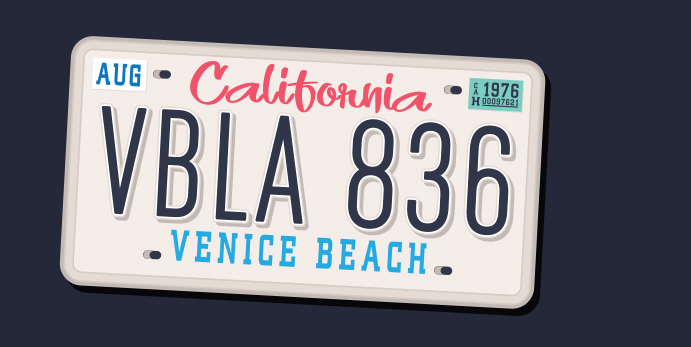 Once you find the perfect license plate that meets your personality and interest, you’ll be cruising the California streets in style! Good luck discovering the license plate that best suites you!